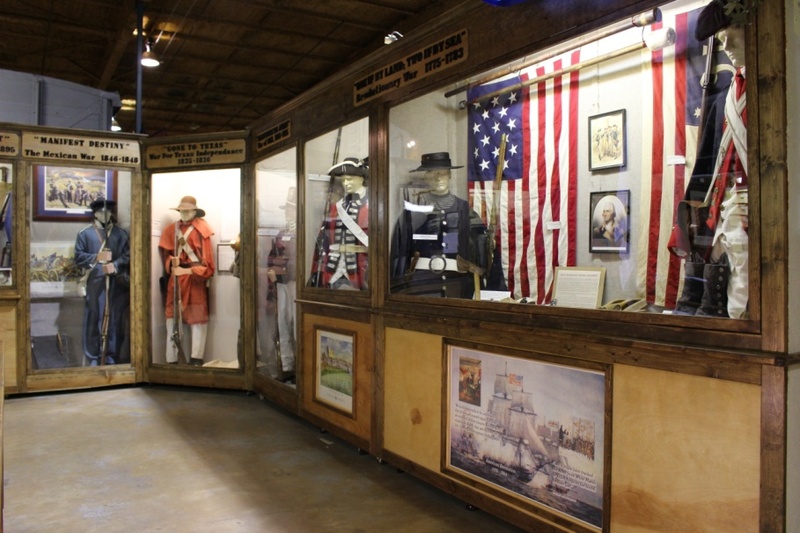 The Veterans Memorial Museum displays more than 30 historical military vehicles from World War I to the present, as well as tableaus, artifacts, and other memorabilia dating back to the Revolutionary War. 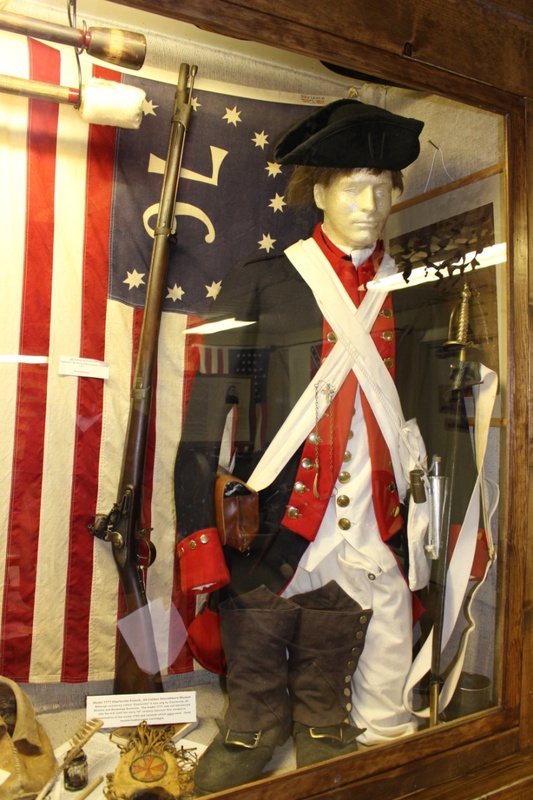 Our pre-Civil War exhibits start with the Revolutionary War. The birth of our Nation: The thirteen colonies of British North America took on the most powerful empire in the world and won their independence. Most of the men who fought were militia, men who grabbed their hunting rifle off the wall and ran to take on the British. Often they would shoot from behind trees and shoot officers off their horses, an act considered by the British to be ungentlemanly. In many ways this was a guerrilla war. We knew we stood little chance standing toe-to-toe with British regulars till later in the war, so we fought anyway we could. Eventually our regulars grew strong enough to force the British off our shores, but we never would have gotten there without the militia. Though passed over in many textbooks today, the Mexican War was a major event in our young nation’s history. It was here that many of the men who played leading roles in the Civil War first tasted combat. Men such as Lee, Grant, Stonewall Jackson and many others fought together against a common enemy on foreign soil. It was also the first time our flag was flown over a foreign capital when our U.S. forces under the command of General Winfield Scott captured Mexico City. The Civil War was the most costly war our nation has ever fought. More than 600,000 men died in four years of hellish combat. Brother fought brother and father fought son. Many of the officers on both sides had trained and served together before the war and knew each other’s families. Advances in technology combined with outdated tactics gave rise to enormous casualties on both sides. Eventually the Union advantages in men and material and victories like Gettysburg led to a Federal victory and the preservation of the Union. 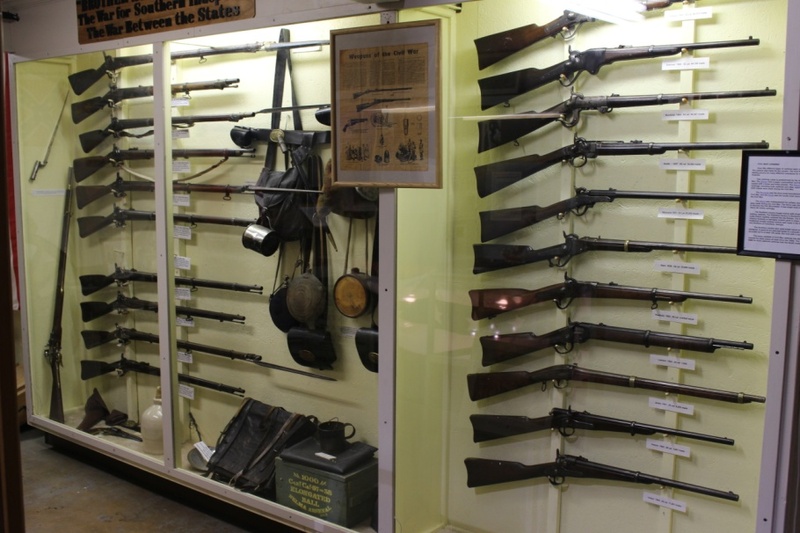 The U.S. Veterans Memorial Museum possesses an extensive collection of carbine rifles, which are on display in our show cases. 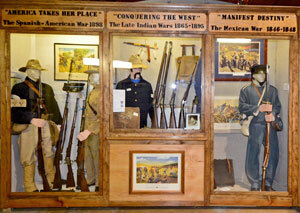 Each rifle tells a history of the time and is a valuable artifact to the museum. “The war to end all wars” started in 1914 with the assassination of Archduke Franz Ferdinand of Austria. Initially the United States stayed out of the war. The feeling at home was one of isolation from problems overseas. Finally in 1917, after Germany sunk the passenger ship Lusitania, the United States joined the Allies in the war.With the influx of men and weapons from America, the tide was turned against the axis powers and the bloodiest global conflict the world had yet seen was ended. Few imagined that 20 years later, the United States would be drawn into another global war. 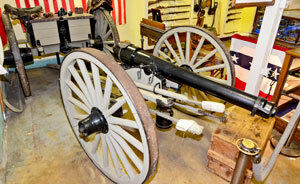 This section of the museum features a Mle 1917 as the 155 mm Howitzer Carriage, Model of 1917 (Schneider) as well as a variety of uniforms and equipment from the First World War. Once again, when hostilities broke out in Europe in 1939, the United States elected to sit on the sidelines. The horrors of the First World War were still fresh in the memory of millions of Americans. It would again take an unprovoked attack to bring the United States back into the fray, when the Empire of Japan attacked Pearl Harbor on December 7, 1941. U.S. forces fought on many continents and two oceans to preserve freedom around the world. As it had in the last war, our ability to produce ships, tanks, airplanes and millions of troops turned the tide on battlefields in Africa, Europe and Asia. As President Roosevelt said, we became the Arsenal of Democracy. 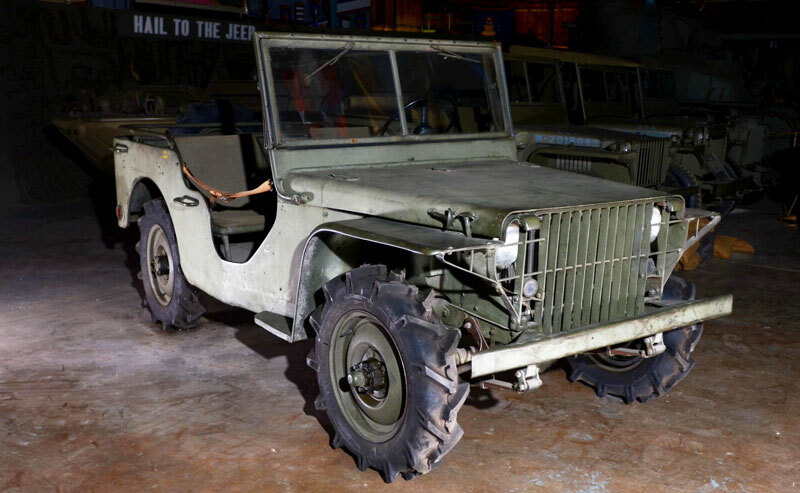 Many vehicles that were in use during World War II are on display in our indoor and outdoor exhibition area. The museum is proud to be able to show a variety restored vehicles from a Ford GP Jeep to a 1944 Harley Davidson. The highlight of this exhibit is our Ford Pygmy, the oldest known surviving example of the vehicles that became the jeep. The exhibit on the Korean Conflict offers a variety of helicopters and military vehicles used during the time such as the Bell H-13D Helicopter, a Korean War Medevac Helicopter. In the 1960s, the “Cold War” went hot in Asia again. This time the United States tried to preserve South Vietnam from the North Vietnamese who were backed by both China and Russia. For over a decade millions of American service men fought in a war that came to be detested back home and many of them came back to an America that wanted nothing to do with Vietnam or them. Over 58,000 men died in a conflict that only recently the country is coming to terms with. Hundreds of thousands of American soldiers held the line for a decade till changes in the political tide caused us to leave. The exhibit on the Vietnam war displays a variety of weapons and uniforms from the era. For more than a decade, we have been fighting in the Middle East in the War on Terror. September 11, 2001 brought us into new conflicts against new enemies. We have fought in both Iraq and Afghanistan against an enemy that is hard to identify and kills and wounds our soldiers with bombs we can’t see. Though we have left Iraq, thousands of our men and women still serve in Afghanistan. 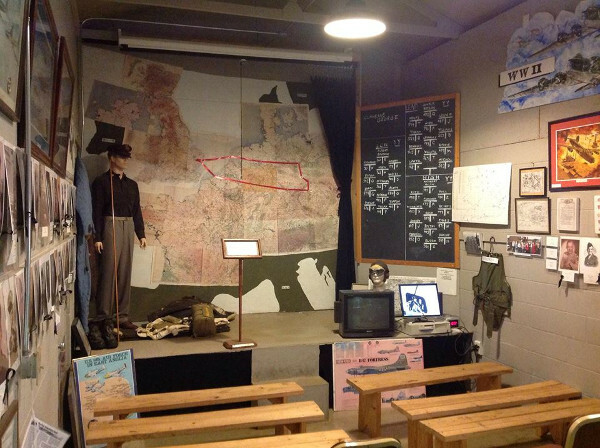 The U.S. Veterans Memorial Museum's Eighth Air Force Briefing Room is a scaled replica of the briefing room of the 385th Bomb Group, USAAF in Great Ashfield, England during 1943-45. It was built from memory by Bill Varnedoe, a Lieutenant and B-17 Navigator with the 385th Bomb Group from 1944-45. Mr. Varnedoe was aided in construction by Harold McMurran, himself an Army veteran of the Normandy D-Day invasion. As the Eighth Air Force had taken over a Royal Air Force base, the team reconstructed the room using the British roof beam style. The light fixtures are period pieces salvaged from a now demolished WWII era ammunition building on Redstone Arsenal. The floor and walls are painted British "gray". The benches and the stage are left unpainted as wood and paint were in short supply at the time and materials were salvaged from spare parts boxes and shipping crates. The maps and formation boards depict an actual mission flown by Mr. Varnedoe designated "Clambake George" that was flown against the rail yards south of Dresden, Germany. On special occasions, Mr. Varnedoe briefs the mission in the actual format and style of WWII. Visitors unable to attend an actual briefing may view a recorded briefing. Photos of members of the North Alabama Wing of the Eighth Air Force Association are positioned around the room. A black ribbon on the photo denotes that a member has passed away. One of a dwindling number of WWII veterans, Bill Varnedoe is a true treasure and great asset to the museum. The outdoor area of the museum gives room for many large collection items, such as tanks, boats, and airplanes. Here you can take a look inside some of these historic reminders, including the UH-1 "Huey" helicopter, the Vietnam era PBR river patrol boat, and the M- 48 Patton tank. Bring your family and enjoy a picnic outside while admiring some of our special exhibit pieces from the First World War to the present day. 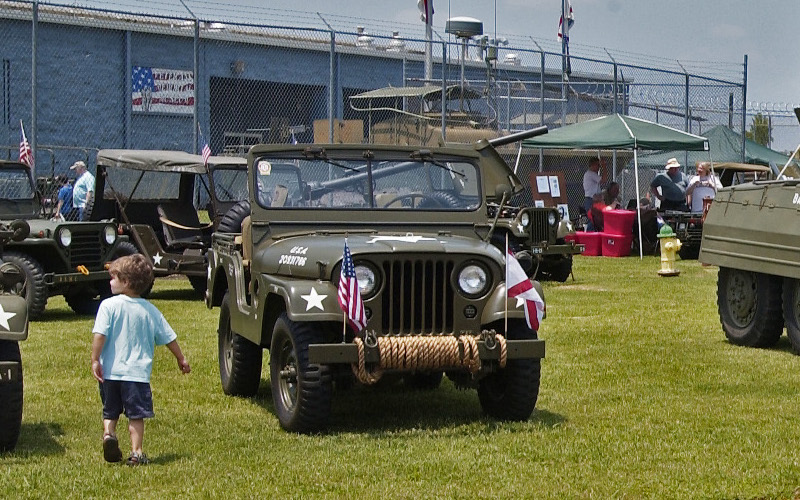 Our outdoor area also serves for a great event space for some of the activities we offer such as the military vehicle ralley. Take a look at our event calendar for current outdoor activities. Without question, the crown jewel of museum's collection is the Ford Pygmy, the oldest known surviving example of the vehicles that became the jeep. Ford was one of three companies competing to fulfill the Army’s requirement for a 1/4 ton Reconnaissance Car.